Operating principle - Retarders - Telma S.A.
Telma induction brakes, commonly known as electrical or electromagnetic retarders, offer an endurance braking system: they dissipate a large part of the braking energy, thus relieving conventional braking systems. Telma induction braking systems dissipate the braking energy by generating eddy currents. Telma induction braking systems are made of a fixed stator and a pair of rotors that are attached to the driveshaft to allow it to rotate. The stator and the rotors are mounted coaxially, opposite to one another, and are separated by a narrow air gap, thereby avoiding any friction. The stator plays the role of the inductor; it is made of a pair of electromagnets, which generate electromagnetic fields when electricity continuously flows through the stator coils, thereby producing eddy currents in the mass of the rotor. Rotors act as induced current. Manufactured with a specially designed conducting material, rotors are only subjected to eddy currents when passed through by magnetic fields generated by the stator while being brought into rotation by the transmission shaft. By definition, eddy currents originate from conducting metallic masses when the latter are placed in variable magnetic fields. In the case of Telma induction braking systems, the variability of the magnetic fields to which rotors are subjected is a result of the rotation of the rotors. Eddy currents, also known as swirling currents, wrap around the magnetic flow lines. The generation of eddy currents in the mass of the rotor leads to the appearance of Laplace forces that counteract with the rotation of the rotor. 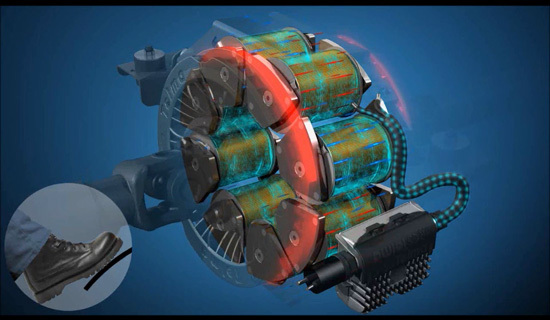 The braking torque that is thus generated and applied to the transmission shaft slows the vehicle. The eddy currents produce a gradual rise in rotor temperature and the heat is then released into the atmosphere through ventilation systems. With Telma induction braking systems, it is thus possible to effectively slow down a rotating shaft without friction and therefore without wear. Although induction braking systems might seem simple in principle, they involve complex physical laws such as materials resistance principles, electromagnetism, thermodynamics and fluid mechanics. Telma's recognized expertise in the field of electromagnetic induction braking systems is based on the detailed modelling of all physical laws involved in the operation of induction braking systems. This modelling has been enhanced by years of practical experience and laboratory testing that have proven to make ​​the difference.